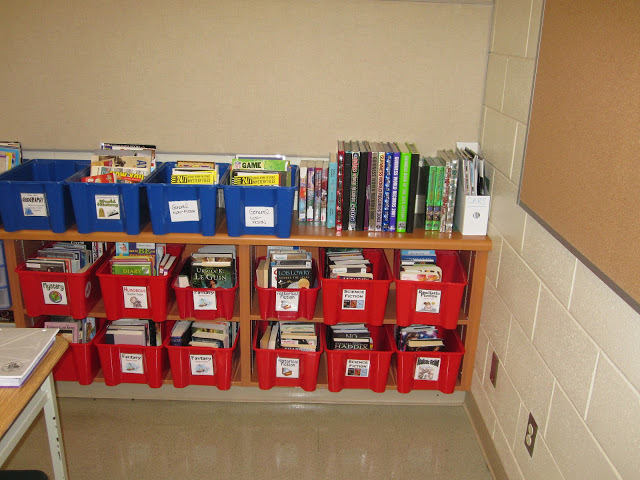 Setting up a classroom library is not a easy task, but it is a rewarding one if done with purpose. Student accessible classroom libraries are an important part of any K through 12 classroom. Since I started teaching my classroom library has evolved from complete chaos to student/teacher friendly organization. Many believe that it is sufficient to have a few books on a shelf or to just use the school library. This is not the ideal situation. 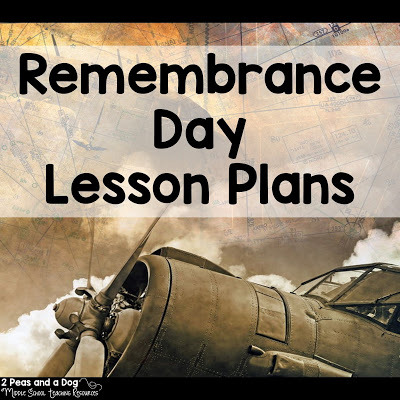 Students in all grades need to have interesting texts available to them at all times. 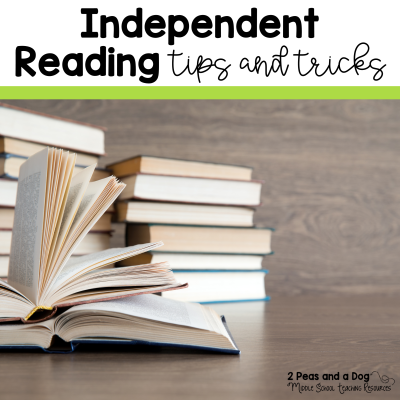 If students do not have access to interesting texts that are organized in a visually appealing manner, they have no incentive to practice their reading skills. I was inspired by this blog post I found one day while searching the internet many years ago. 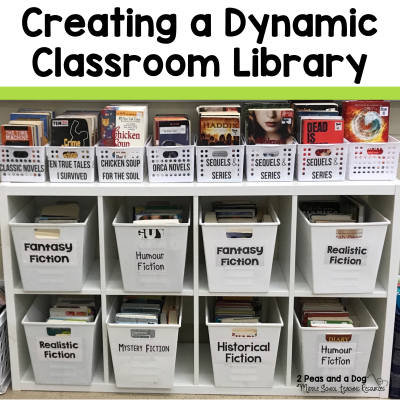 FINALLY I found a great example to model my own classroom library after. 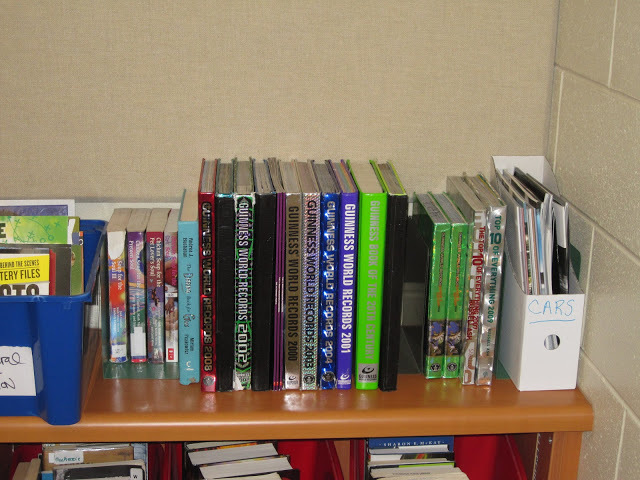 I hope that this blog post can inspire others to renovate their own classroom library. I keep all fiction books in red Ikea bins and all my non-fiction books are kept in blue Ikea bins. This helps reinforce the differences between these two text types. Books that are too big or heavy to fit into bins get stored upright spine label out in metal dividers . Every book has a sticker label reminder of where it is kept. Fiction books are sorted by genre (e.g. Fantasy, Science Fiction, Realistic Fiction) and non-fiction books are sorted by curriculum subject (Science, History, Geography). For years I have tried different sign in and sign out systems. This year I got rid of my sign in and out system and just use the honour system. This works because I only allow my homeroom class to sign out fiction books only. Non-fiction stays in the classroom unless is signed out on a nightly basis on the class whiteboard. My goal is to have a book pocket in the back of each novel and coordinate that with 1 book pocket sign out chart per student. My classroom library is always under renovation. What do I put into a Grade 7 and 8 class library? Luxury car brochures (Lexus, BMX, Audi, Jaguar) I acquired these brochures one Saturday afternoon by driving to the car dealerships and “shopping” for a new car! Weekly Flyers or Advertising Magazines – last year I was shopping for a cellphone and brought the Best Buy comparison magazine into my classroom. It was the most popular text for months. How do I acquire all of these different resources? Before you buy anything new inventory your current library collection to see what the students are reading and recycle any books that smell, are yellowing or are in disrepair. Ask your school librarian and principal/administrator if they can help support your goal of a dynamic classroom library by purchasing new materials for your classroom. 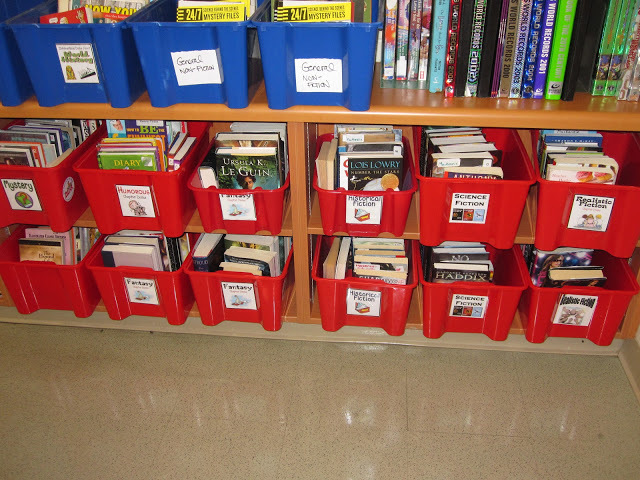 Some schools use credits from their Scholastic Book Fairs to help teachers create a class library. Ask your friends and family members if they have any books their kids do not read anymore. Order the $1.99 and $2.99 specials from Scholastic every month. Check your local library’s discard shelf – most books are under a dollar. Check your local dollar store, thrift or used book stores. Visit your local bookstore and browse the children and teen fiction discount shelves. I have purchased many books from Chapters and Indigo for under $5 a book. Ask if your school hosted a book fair – many book fair companies have teacher only discount sales. I purchased the bulk of my library through the semi-annual Scholastic Teacher Warehouse Sale. Once your library is complete make sure you use engaging reading assignments to keep your students using the library frequently. I always forget the value of the non-traditional texts students always jump to read–brochures, newspapers, advertizing etc. These are the things we are most often reading in our day to day life and they are so appealing to our students. Thanks for the reminder! I love how you differentiated between fiction and nonfiction by the bin color! I have all my books in tubs (the kind that go in the sink) and the books that go in each bin are numbered. All the books in bin one have a one on them. They are sorted thematically. I plan on hanging a chart that explains what theme/genre are in each bin. 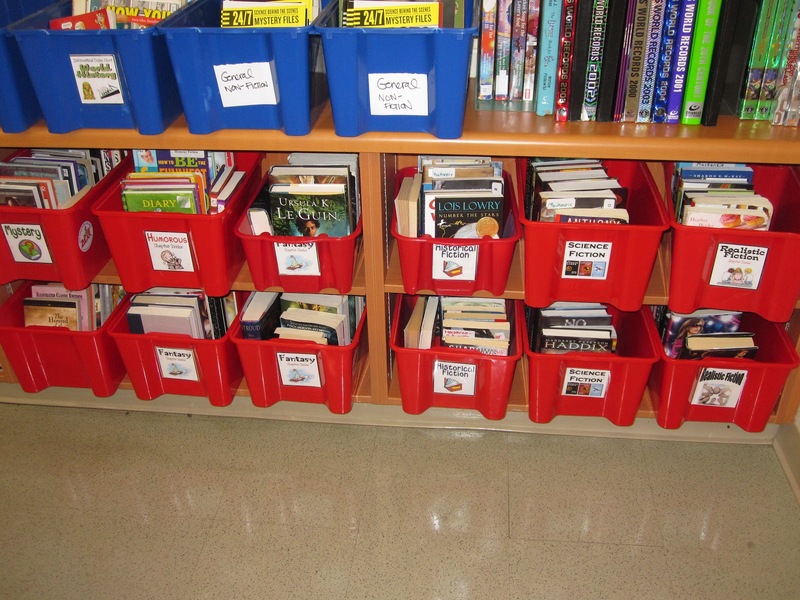 Now that my first graders are almost second graders, I want to give them a cooperative learning activity where each group gets a tub of books and they have to determine the genre or theme before I tell them. What do you do about books that fall into multiple genres? My son would love your classroom library! Brochures for cars would be a hit with him. Thanks for sharing! 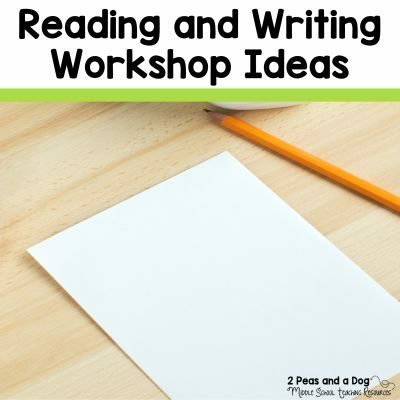 Great ideas…Thanks for sharing! I feel like my library is always under construction too….This coming year I'm re-vamping the whole thing and organizing it according to historical periods…Should be FUN! !